From the shore, I can see open sewers and other unidentifiable waste streams flowing energetically into the water I am about to cross. “Come!” beckoned the ferryman. I hesitate, but the low-riding wooden skiff appears to be the sole way to get to where I am going so I step in and quickly sit down on the planks. Soon enough I am climbing out and into the midst of Korail, one of the largest slums in Dhaka, Bangladesh. During the past year, Dhaka has earned two impressive global superlatives: the densest metropolitan area and the least livable city in the world. 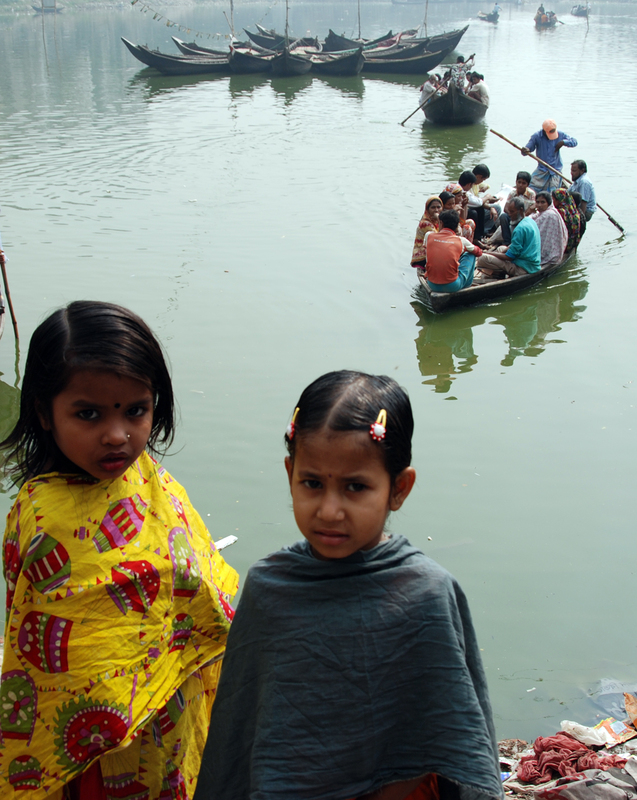 Some estimates put population density in Dhaka's slums at 2.7 million people per square mile. One of the most pressing problems in Korail is access to water and sanitation services. 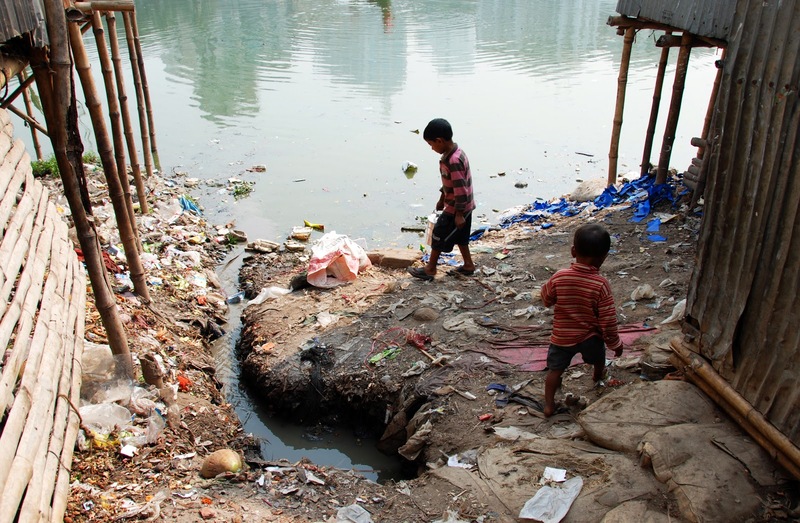 As in many slums in Dhaka, the municipal water and sewerage authority won’t build water and sanitation infrastructure on untenured land. Thus, the residents must rely on a system of illegal plastic flexible pipes to get their drinking water. These flimsy pipes flow through the polluted river I just crossed and weave their way through the open sewage ditches lining Korail’s dirt roads. We stop walking to watch young women collect water from the plastic pipes. They fill up kolshis, traditional aluminum water pots with narrow necks, as well as plastic soda bottles. My tour guide and interpreter is from the International Center for Diarrheal Diseases Research, or the “cholera hospital,” as dubbed by locals. We ask the women how often the water comes. Once per day, usually in the morning, but the actual time varies daily, they explain. We continue through a concrete courtyard encircled by rooms with clothe doors; each is home to a single family. This is a typical living arrangement in Dhaka slums, with 10-15 families sharing a common cooking area, water supply, and toilet. Drinking water is rarely treated, but when it is, boiling is the preferred method. There is no gas stove in the compound - families must use charcoal to cook and boil water. I ask to observe the compound’s toilet, but it is broken. They use the neighbor’s, a “hanging latrine,” which is a wood platform suspended over water flowing into the lake we crossed earlier. These are quite common in Korail, considering the community is surrounded by water. Getting clean and cheap drinking water to Dhaka’s slum residents is an enormous task, and one of the main objectives of my research in Bangladesh. Today, the plastic pipes and hanging latrines give me an idea of the challenges ahead.